Bits: 10% off Blacklane for new users, 1p Avios via Groupon Spain, the underwater InterCon is really opening! Airport chauffeur group Blacklane – website here – has launched a new 10% discount code for first time users. I have just used this to book a car for Milan later this week – given how much luggage we’re going to have, plus the kids, I thought that guaranteeing an SUV was available and waiting for us made sense. I signed up my wife so we could get the 10% first user discount ….. These Spanish Groupon offers – unlike the recent Irish offer – can get messy. All of the information is in Spanish (Chrome can translate) and if you have problems you are dealing with the Iberia and Spanish Groupon contact centres. You can buy a LOT of points though. The limit is 5 coupons per Iberia account for the 4,000, 20,000 and 35,000 Avios packages and 10 per account for the 8,000 and 15,000 Avios packages. These Avios can be transferred across to British Airways via ‘Combine My Avios’ without any problems. Buyer beware though. The InterContinental in a quarry is really opening! Back in 2013, I wrote about plans to build an InterContinental hotel in a disused quarry near Shanghai. Not only would the majority of the hotel be below ground level, but two floors were actually going to be underwater. I’m not sure anyone really expected it to happen, and the 2015 opening date came and went. However, bizarrely, InterContinental Shanghai Wonderland is now ready to open. “InterContinental Shanghai Wonderland is expected to open its doors in the fourth quarter of 2018. 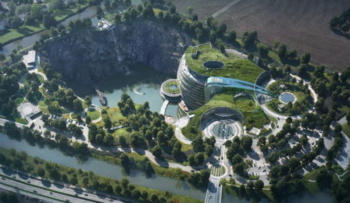 Developed by Shimao Group and managed by InterContinental Hotels Group (IHG) the luxury hotel, mostly below ground, is getting ready to welcome guests with an amazing landscape in a deep pit of a former quarry in southwestern Shanghai. The 18-story hotel has two floors above ground, and 16 below ground, including two floors underwater. With a construction area of more than 61,000 square meters, the hotel features 336 rooms and suites that all boast balconies where guests can enjoy a spectacular view of waterfalls from the surrounding cliffs. If you are keen to be the first to stay, you can find out more via the InterContinental website here. Booking does not seem to be open yet. Folly or stroke of genius? We will find out soon enough. AMEX SPG – Anybody had any more feedback from American Express on the retention offer that seems to have been messed up in the Marriott merger? For others not aware, there was a retention offer of double points (2 points instead of 1 per £) for keeping the SPG AMEX instead of cancelling, however the base rate has now moved to 3 points in the new scheme, but AMEX are saying that its still only 1 extra point per £ instead of the logical double of 3! 1) My Curve limit is 10k p.a., asked for a raise, they said no… joined in circa May-18. Annoyed! 2) Did the Gold Charge to Platinum upgrade: a) The £1k spend to hit bonus is not showing up as an offer, assume I will get bonus anyway? b) When do they charge you the annual charge? 1) Do you actually spend on Curve? iii) not at all – until Gold charge anniversary. 1) I spend only to pay my amex / other credit card bills (double dipping). Actually do some spending on the card and they might raise your limits. And if they catch on as to what you are doing they may suspend your curve rather than up your limit anyway. Thanks did you need to ask for the upgrade or was it automatic? I’ve had my upgraded platinum since January and not paid any fee, which seems to be quite common judging by comments on here. Shame they changed the gold card to a credit card as the platinum upgrade bonus and then 5x referral bonuses whilst paying no fee was great while it lasted. I have just purchases the smallest amount via Groupon deal to test the water before committing to any large amounts. Anyone have an idea of how long it takes for your voucher to become redeemable? Also how long is it before the points hit your iberia account? I have done something similar. I couldn’t find the the voucher codes on the website, I had to download the app to find them. It is supposed to credit to Iberia within 10 days. I will let you know! Still havent received them. Starting to get slightly nervous!